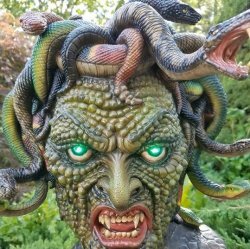 4/23/2019 We have temporarily removed Medusa from our website store as we re-mold her. The castings from this new mold should be superior than previous castings. Tighter, less clean-up, and smoother castings. The molds should be done in three weeks and castings immediately afterward. Bust to ship in about four weeks! UNPAINTED 360 degree Life-sized, Polystone Bust/Statue of Medusa. 1:1 scale 360 Series painted resin bust, sculpted by Joe Simon. Some assembly required. Important Note: International buyers must contact us for a shipping quote before selecting this item.